SarahViz.com: Renovating Our Trenches: New Tile! Renovating Our Trenches: New Tile! Instead of going to Myrtle Beach this year, we sadly decided to be fiscally responsible (I can barely even type that with a straight face...) and do some much-needed renovations around the ole' homestead. Doesn't it seem like when one thing breaks, then a string of things break all at once??? So we created a spreadsheet. Wrote down all the home improvements we needed to do. Figured out the best way to add to our debt borrow some money and then got started. First: (This seems stupid but was oh so needed) A new garage fridge. The freezer had stopped working completely and the refrigerator part was barely keeping the beers soda and water cold. Hubby bought a new one on super-clearance at Sears and all was well with the beers world again. Second: New entryway tile. Our old entryway was shiny white tile with missing grout and loose tiles. Hideous. Our new tile? Soooo much better! Third: While we were doing tile, we figured we may as well replace the linoleum in our downstairs half bathroom. 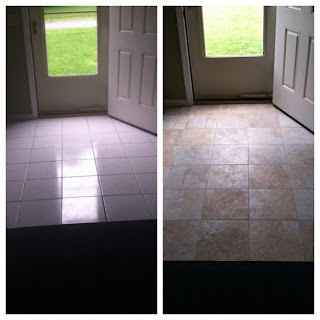 The old linoleum flooring was miscolored, cheap-looking and definitely pee-soaked. So tah-dah....new tile in the bathroom as well! So while not going to Myrtle Beach this year was pretty sad, I'm excited to finally be GSD! We have a garage fridge. AND a chest freezer. Our second fridge used to be our first fridge until it started making moose sounds in the middle of the night. It moved to the basement to call all the moose it wanted, but promptly quit making noise. Anyway, the new fridge makes me happy and holds food. The basement fridge holds beer and wine and overflow when we have parties. My husband was pretty adamant about having two fridges.